…The strange creature with scales like a dragon is said to have the power of prophecy and to make strong and wise any who would eat it…. In The Oracle Who Ate Ants, author David Scott Lillis has written a fantastic tale about an African pangolin and a boy whose lives become entwined. 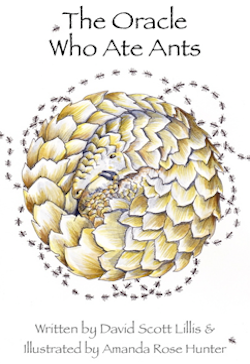 David has generously offered to donate a portion of the proceeds from the book’s sales to Save Pangolins in support of global pangolin conservation efforts. This book is available now through Amazon in print and for the Kindle. An audio version of this book is coming soon. A portion of the book sales will go to pangolin conservation efforts.